RESEARCHERS have discovered a NEW cancer test that could revolutionise early detection of dangerous tumours stopping the spread and potentially saving THOUSANDS of lives. The new imaging test spots the most aggressive cancerous tumours before they have chance to spread, and will give much-needed hope to future cancer patients, finds study. This exciting breakthrough could mean dangerous tumours are dealt with quickly and enables doctors to plan more effective courses of radiotherapy. Scientists from the University of Manchester and The Institute of Cancer Research in London set out to develop magnetic resonance imagining (MRI) technology able to map areas of oxygen deprivation within tumours. They called the new technology, oxygen-enhanced MRI. The researchers explain that hypoxia – a deficiency in the amount of oxygen reach tissue in the body – is often a sign that cancer is growing aggressively. Hypoxia plays a central role in tumour progression and resistance to therapy, by stimulating the growth of blood vessels within tumours, fuelling the spread of cancerous cells around the body. Using the technology, the scientists were able to map the hypoxia in tumours by monitoring alterations in image intensity caused by fluctuations in the concentration of dissolved oxygen in blood plasma and tissue fluid. The areas taking up the extra oxygen are easily detectable as they show up more intensely on an MRI scan, compared to the hypoxic tumour areas which tend to be depleted of oxygen. Study co-leader Dr Simon Robinson, of The Institute of Cancer Research, said: “Our technique uses MRI technology to detect tumours with areas of oxygen depletion, which tend to be more aggressive and more resistant to radiotherapy and chemotherapy. Study co-leader Dr James O’Connor, of Manchester University, said: “There is currently no validated, affordable and widely available clinical imaging technique that can rapidly assess the distribution of tumour hypoxia. “Our findings from studies in mice are already being translated for use on conventional clinical MRI scanners. Aside from early detection being a boost to a positive prognosis, this scientific breakthrough could mean that doctors are able to tailor treatment to a patient’s needs. Nell Barrie, senior science information manager at Cancer Research UK, said: “When cancer cells run out of oxygen, they’re more likely to spread from the original tumour, making the disease much harder to treat. “Spotting this process in action could help improve treatment, especially for more aggressive tumours, and this early-stage research in mice will help to find new ways to use existing scanning technology to monitor and personalise each patient’s treatment. After being tested on mice, the research is being further developed though clinical trials involving cancer patients. The study, published in the journal Cancer Research, could also lead to new ways of monitoring whether radiotherapy or some cancer drugs are working. More than 330,000 people are diagnosed with cancer every year in the UK and there are just over 160,000 deaths. Preventable cases of cancer currently stand at 42 per cent. 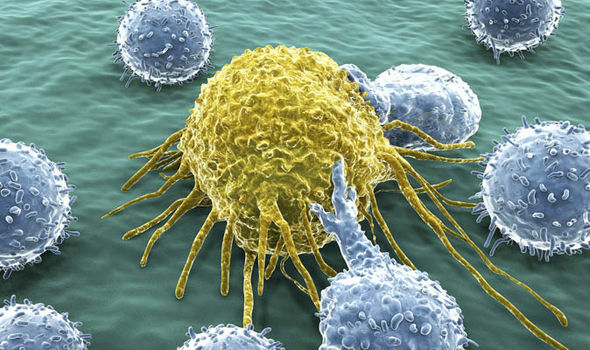 Cancer survival is also improving and as has doubled in the last 40 years in the UK.